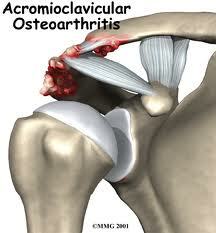 Osteoarthritis is the most common type of shoulder arthritis. Also called wear-and-tear arthritis or degenerative joint disease, osteoarthritis is characterized by progressive wearing away of the cartilage of the joint. As the protective cartilage surface of the joint is worn away by shoulder arthritis, bare bone is exposed within the shoulder. The other common type of shoulder arthritis is rheumatoid arthritis. Rheumatoid arthritis is a systemic condition that causes inflammation of the lining of the joints. This inflammation can, over time, invade and destroy the cartilage and bone. Shoulder arthritis typically affects patients over 50 years of age. It is more common in patients who have a history of prior shoulder injury. There is also a genetic predisposition of this condition, meaning shoulder arthritis tends to run in families. What are the common symptoms of shoulder arthritis? Shoulder arthritis symptoms tend to progress as the condition worsens. What is interesting about shoulder arthritis is that symptoms do not always progress steadily with time. Often patients report good months and bad months, or symptom changes associated with weather changes. This is important to understand because comparing the symptoms of arthritis on one particular day may not accurately represent the overall progression of the condition. Evaluation of a patient with shoulder arthritis should begin with a physical examination and x-rays. These can serve as a baseline to evaluate later examinations and determine progression of the condition. Or you can make an appointment here with us now!